If you were to ask someone what their favorite visual novel might be, then there is a pretty good chance that something from Key’s line-up of titles would be named. Famous for their emotionally gripping games Clannad, Kanon, and Air, all of the aforementioned visual novels have already been given anime adaptations and now Little Busters! has been adapted into an anime and the first half of season one has been released in North America. Now that Little Busters! Collection One is available, does it still hold everything that Key has been known for? Riki Naoe’s parents passed away at a very young age and while he was lost in his grief, four children came to him to help raise him from his depression. 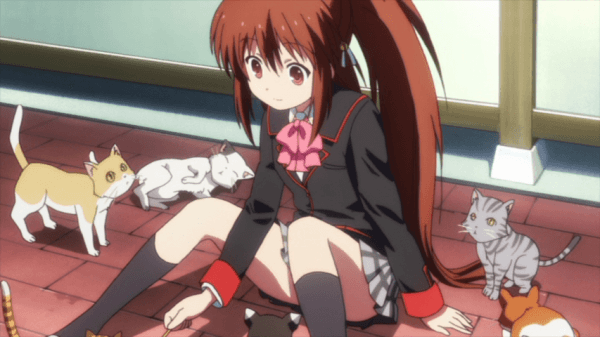 This group consisted of three boys and a girl who all called themselves the Little Busters, a group that would fight evil and preserve justice. After finding hope in life again, Naoe joined the Little Busters on all of their little adventures and the group became a tight knit group of friends. Now many years later all of the Little Busters are in high school and the leader of the group, Kyousuke Natsume is in his last year of school, about to graduate from high school. While not having a plan for the future, Kyousuke cares more about making the most of his time left with his friends than anything else and because of this he wants to form a baseball team with his friends. The only problem is, the group consists of Kyousuke, Naoe, Kyousuke’s shy younger sister Rin, the musclebound Masato Inohara, and Kengo Miyazawa who has devoted all of his time to kendo. 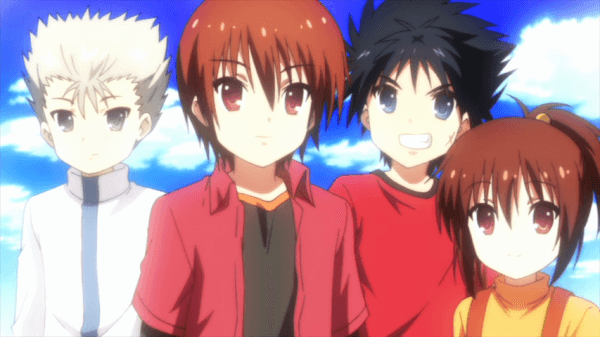 After learning that Kengo will refuse to join the team because it would take time away from his kendo work, the Little Busters only have four members to play baseball with while at least nine players are necessary. Because of this, Kyousuke charges Naoe with the task of recruiting members to join the baseball team, preferably female members considering the current set-up has far more men than women. Naoe is far from your standard protagonist; he is rather frail in appearance and suffers from narcolepsy which can suddenly cause him to fall asleep regardless of what is happening around him. After he is tasked with recruiting more members for the team, Naoe and Rin discover a message tied to a cat that says that there is a secret to this world and the only way to discover that secret is to complete various tasks that will be revealed in time. What unfolds from here is both a heartwarming story of friendship as well as one that tackles some of the hardships of life along with a heaping dose of cute girls and comedy. While the secret to the world will probably take on more importance later in the series, Collection One only features two instances where that story point is explored and questions are raised about the source of the tasks. Instead Collection One primarily focuses on growing the Little Busters by introducing new characters and having fun slice of life style events in-between. For the most part, this works well since although the main focus is introducing new characters, there are storylines for specific characters interspersed in Collection One as well, the first one being the cheerful Komari Kamikita who has a rather tragic event in her past that Naoe and the rest of the group try to help her overcome so she can return to being the happy girl that she used to be without trying to deny the past anymore. 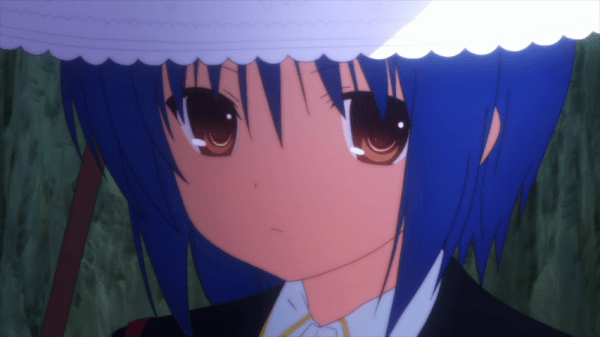 The second major arc included in Collection One actually leaves viewers with a rather drastic cliffhanger as another girl that Naoe has become friends with and introduced to the Little Busters vanishes and is replaced by a look-alike with a completely different personality. Since this release only covers the first thirteen episodes of the series this story arc remains incomplete with this release and also introduces a few supernatural elements to the story. As far as the comedy goes, there are a few jokes that tend to be overplayed such as the duels between Masato and another member of the group which always end up with Masato losing badly and receiving an insulting title. One thing that the series does excel at is creating charming characters, especially a certain transfer student named Kud, that help make the various slice of life sequences nice and enjoyable. Little Busters! Collection One takes its time to progress the story and while it may seem like everything is moving too slow at a slice-of-life pace, it actually provides a rather heartwarming show as we see this group of friends tackle the issues of those around them and grow closer together. 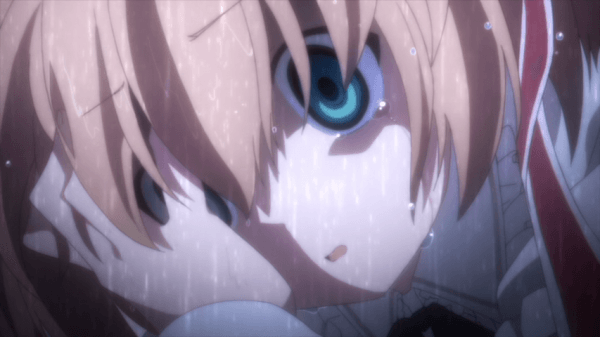 It is unfortunate to say that while Little Busters! Collection One may be very bright and colorful with some great looking background scenes and character art, the animation is far from impressive. While each of the characters are nicely designed with a fair amount of detail put into each one to make them unique and cute looking, especially in regards to the female cast as Kud, Rin, and Kurugaya have all been given a high level of detail. Unfortunately the actual animation work looks rather rough at times with the quality taking significant dives during mid-range shots, even a few close-up angles are pretty bad looking, and whenever more than a few things are in motion the series begins to look generic. That being said, it does appear that J.C. Staff put a lot of effort into making dramatic scenes look great in an effort to drive home the emotional impact of the events occurring on screen. With the release of Little Busters! Collection One Sentai FIlmworks has provided an English dub as well as the original Japanese voice track with the release. The English dub for the series is actually rather impressive although a few people may be caught off guard when they hear Naoe’s voice as he is voiced by a female voice actress named Shannon Emerick. Despite being a male character, the voice actually matches his appearance and demeanor. 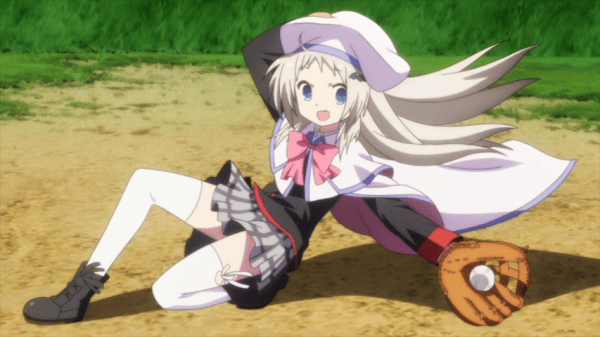 The rest of the cast also does a nice job with their voice work, including Kud’s voice actress which lays on a thick Russian accent as she speaks partially broken English to match the character. Although the dub work is impressive, it is worth noting that there are many times that the voice work does not match up with the mouth flaps of the characters. This usually results with the character’s mouth still moving a bit after the final word has been said, and it looks rather awkward as the timing could have been better. As far as the soundtrack goes, the series features some key pieces of background music that are used throughout the first half of the season and each of them are rather fitting, especially for emotional scenes. 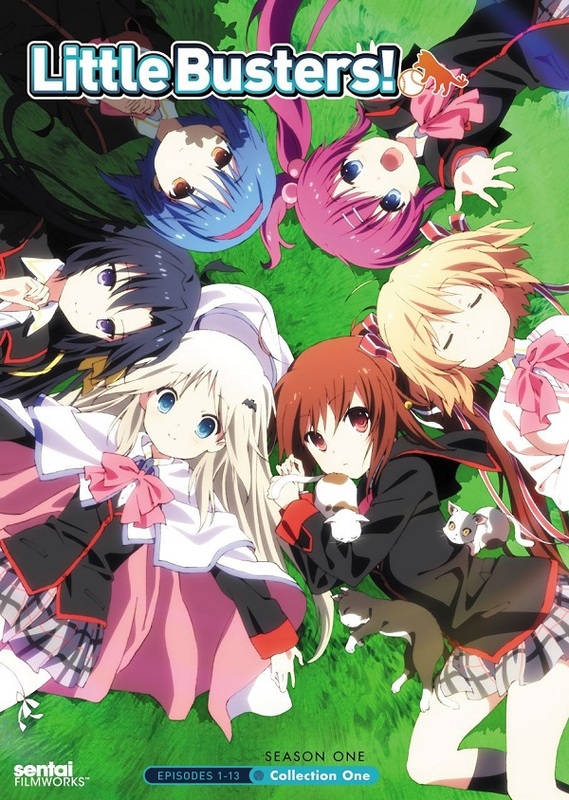 The opening theme “Little Busters!” and “Alicemagic” are both performed by Rita and are songs used from the original game release but slightly altered for use in the anime. Unfortunately Little Busters! Collection One contains some rather rudimentary bonus features outside of the background music included on the main menu. There are disc credits and trailers for other Sentai Filmworks anime on the first disc while the second disc features a clean version of the opening and ending theme presented in this first half of the season. Little Busters! Collection One could easily be considered something of a harem show at first glance as it unfolds similar to one since the main character is gathering new female players to join the Little Busters but it instead a story about friendship and helping out those close to you. Throughout the first half of the series we are introduced to most of the main cast and experience a few emotional moments as they handle Komari’s past and begin to deal with another mysterious issue before the end of this collection. 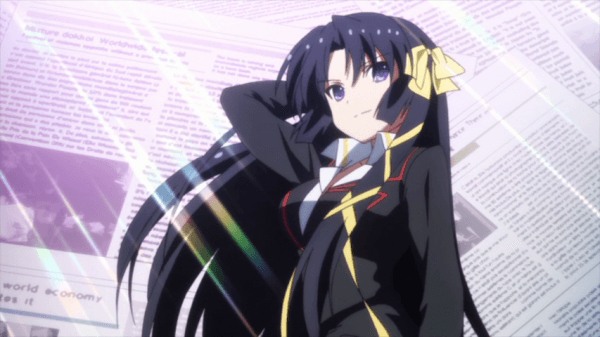 Though some of the jokes run thin and the animation is iffy at times, Little Busters! Collection One’s charming cast makes for an enjoyable experience that leaves viewers wanting more.